It’s tough in the city, especially at night and this is an online slot machine which attempt to bring that edgy atmosphere to the reels. 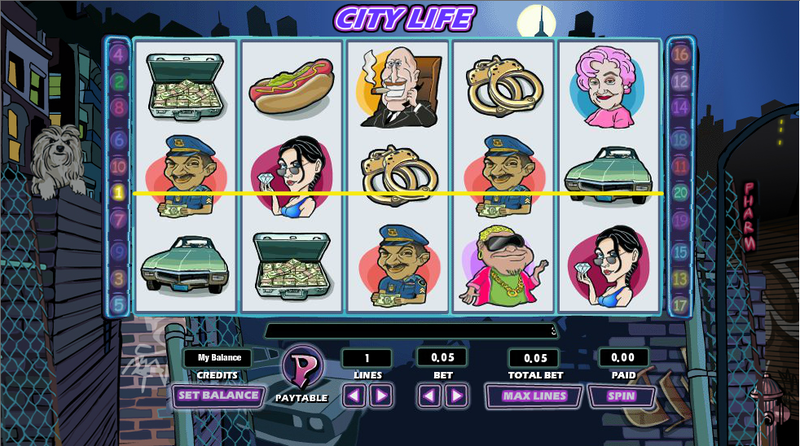 It’s called City Life, it’s from Random Logic and it’s the predecessor to the popular City Life 2, also available to play at 888 Casino. Read on to find out more about this game – the cartoon graphics and creative bonus feature are worth checking out. 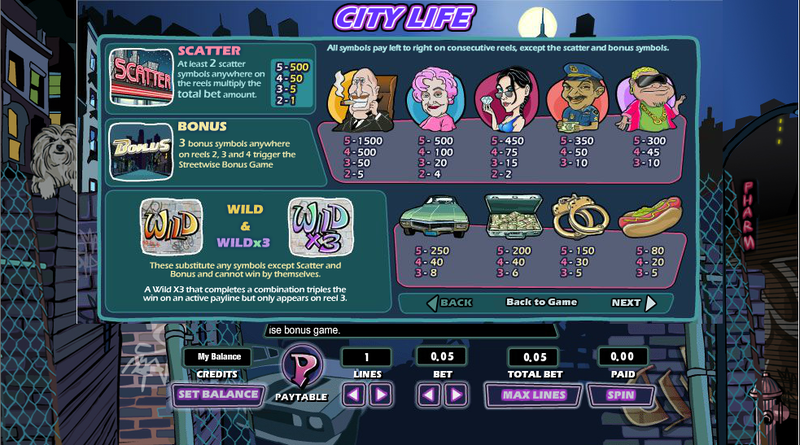 City Life plays out over five reels and up to twenty paylines; the backdrop to those reels is a gloomy city alleyway where a short stroll will probably end up in an unpleasant experience. All the symbols are related to the theme and include a hot dog, handcuffs, a briefcase of cash, a funky car and five different characters who all reside in this area. The scatter symbol is a big ‘Scatter’ and the bonus is a large ‘Bonus; there are two wild symbols – a standard one and then a ‘Wild x 3’ which only appears on reel three and which will multiply any wins to which it contributes by 3x. The bonus symbol in this game only appears on reels two, three and four and if you can land them there on the same spin you will trigger this feature. You will now be presented with five dodgy-looking characters who are all trying to rip you off. Pick one of them to try and outwit. You must now pick from a number of items to find three of a matching value – do that and you will win the total value of those items. The nature of this game means that you can’t re-trigger it. This is a relatively simple game but it’s easy to see why it’s still so popular; it looks and sounds good with lots of well-drawn characters and it’s got a bonus feature which was designed with some though and creativity. Check it out before trying City Life 2.